It looks like my prediction on black wave 1 and wave 2 rebound turned out to be very accurate. 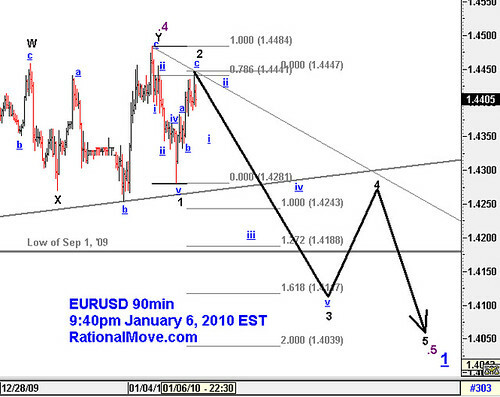 The low point of wave 1 was 1.4281 just 10 pips below my prediction. We cannot expect the prediction to be this accurate so often, but the accuracy often can be high enough for us to plan a profitable trade with sufficient probability of winning. This is the justification of participating in the unbeatable game. As I write this, I just offered a half of what I plan to hold as short position at 1.4410. My loss-cut line for this is 1.4490. I will wait another 8 hours or so before placing more orders.